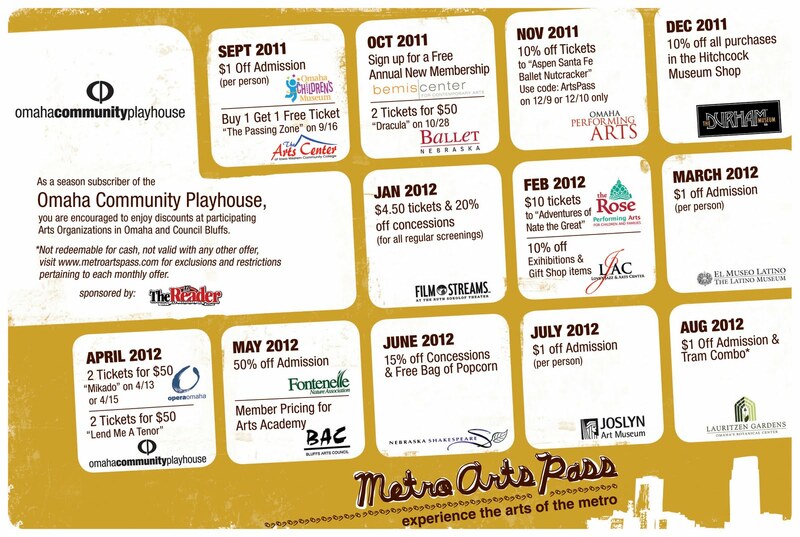 Enjoy the arts with a Metro Arts Pass! If you are a season subscriber to the Omaha Community Playhouse, in the month of November, you can receive 10% off tickets to Omaha Performing Arts' "Aspen Santa Fe Ballet Nutcracker" on Dec. 9 or 10. It just isn't Christmas without A Christmas Carol. 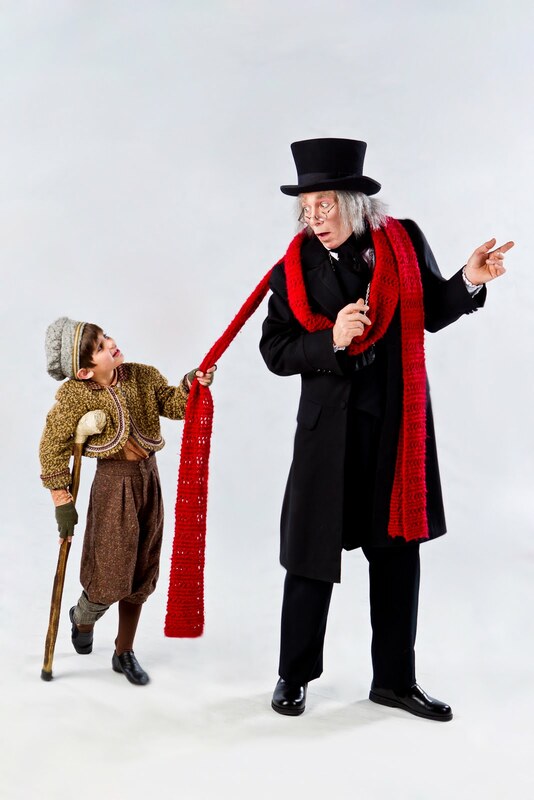 An Omaha holiday tradition for 36 years, Scrooge takes us on a life-changing journey that shows us it truly is much better to give than to receive. This year, we ask you to make giving a part of your holiday tradition. Hunger affects more than 26,000 children in Douglas County and 92,000 across Nebraska. This holiday season, the Omaha Community Playhouse is partnering with Omaha Performing Arts, Omaha Symphony, Opera Omaha and ConAgra Foods to collect non-perishable food items for the Food Bank for the Heartland as part of Shine the Light on Hunger. For more information, call (402) 553-0800. ConAgra Foods is doing its part to make sure child hunger ends here! Join us to help the more than 16 million* children in America, including the Omaha-Metro area, who don't have consistent access to food throughout the year. 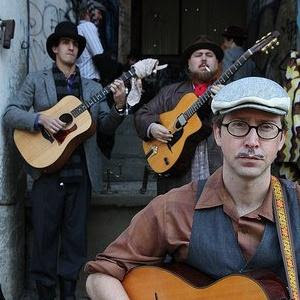 Omaha Community Playhouse's 21 & Over program is pleased to present Manouche Moustache. 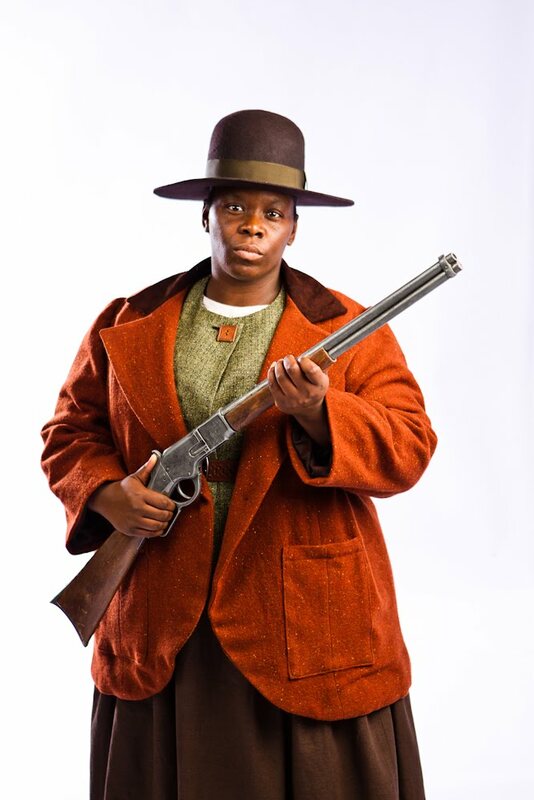 Set in the all-black town of Nicodemus, Kansas, Flyin’ West tells the story of four courageous, Black pioneer women who have come west to build a new life for themselves, free from the racism and oppression of the South. Director Susie Baer Collins, her husband, Dennis, and Flyin’ West actress Denise Chapman had the opportunity to visit Nicodemus, Kansas. Their travels not only took them on a historical journey but a sentimental one as well. Each year an annual celebration is held in the town hosting festivities to honor the original settlers and descendants and preserve the tradition and culture of Nicodemus, which is now a national historic park. Susie and Denise, who plays Sophie Washington in Flyin’ West, experienced first-hand what it was like to be a part of the rich heritage and culture of Nicodemus. They attended the celebration this past July and saw a re-enactment production of the Buffalo Soldiers Calvary Regiment and watched a ballet excerpt based on Flyin’ West by the Atlanta, Georgia, ballet company, Ballethnic. “What really captured our hearts was witnessing the heartfelt reunions of families and the exciting discoveries of those who suddenly found themselves related to one another that still occur at this annual homecoming,” said Susie. 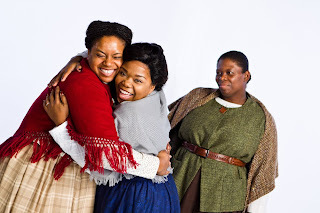 Flyin’ West takes a look into the historic time period after the Emancipation Proclamation when African-American settlers had begun their journey where no colored man had dared to venture. 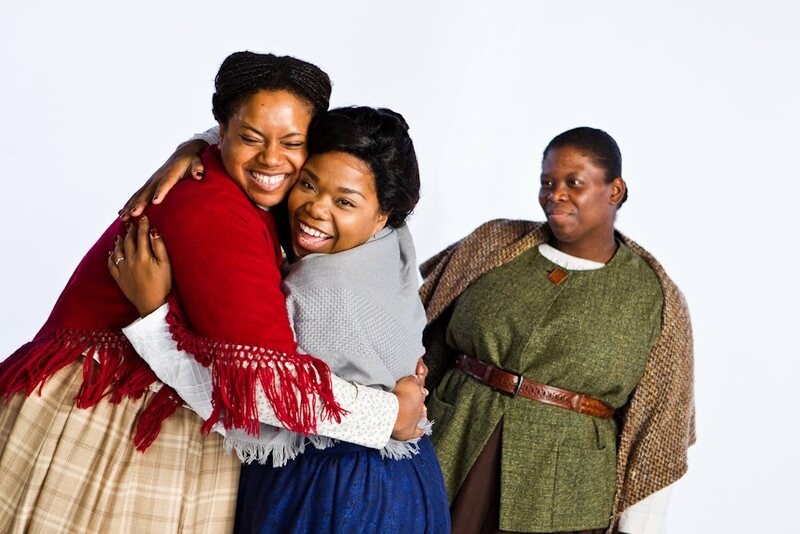 Written by African-American playwright Pearl Cleage, the story follows four women as they start their new life as free individuals. Chapman said her character Sophie’s objective is to shelter her family from the outside world of prejudices. The characters in the play possess personal complexes and endure struggles. Amidst tensions that arise, the women unite to stay together despite their differences and keep the tradition of family morale alive. Flyin’ West runs October 21–November 20, 2011 in the Howard Drew Theatre; Thursday–Saturday, 7:30 p.m. and Sunday, 2 p.m. To purchase tickets, or for more information, call (402) 553-0800, or visit the Box Office located in the southeast corner of the Omaha Community Playhouse at 6915 Cass St.
Get your holidays off to a merry start by joining ACT II for “A Dickens of a Christmas” November 18 and 19. 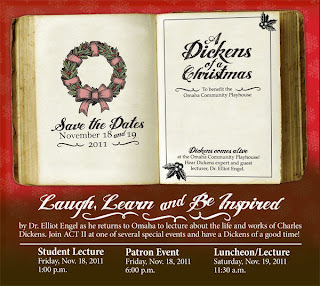 “A Dickens of a Christmas” will include three fabulous events to benefit the Omaha Community Playhouse and will feature Dr. Elliot Engel, a noted scholar and expert on Charles Dickens. The events are open to the public and tickets for each event are available through the OCP Box Office at (402) 553-0800. •On Friday, November 18 at 1 p.m., Dr. Engel will present a special lecture for area high school and college students. This is a remarkable opportunity to enhance the literature curriculum in area schools. Dr. Engel’s literary and historical programs are used in classrooms around the world and his mini-lecture series on Charles Dickens has run on PBS stations around the country. Tickets for this special lecture are only $3. Groups of 10 or more may purchase $2 tickets. •On Friday, November 18 at 6 p.m., there will be a special meet and greet and book signing event with Dr. Engel including heavy hors d’oeuvres and drinks. Tickets for this event only are $75. •On Saturday, November 19 at 11:30 a.m., there will be a special holiday luncheon featuring authentic Dickens’ era food and drink with a lecture by Dr. Engel following. Tickets for the luncheon and lecture only are $50. There will also be a limited number of Saturday lecture only tickets available for $20. Purchase of a patron level ticket for $125 will allow you to attend the Friday evening meet and greet and the Saturday holiday luncheon and lecture. 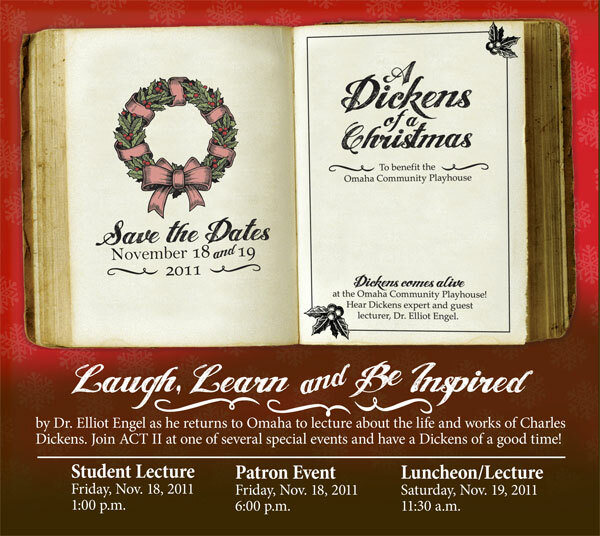 “A Dickens of A Christmas” are fundraising events produced by ACT II, a support group dedicated to the promotion of the Omaha Community Playhouse. Event co-chairs are Judy Wickersham and Francie Prier. The events have been graciously sponsored by The J. K. Barker Foundation and Judy and Gale Wickersham. To learn more about ACT II and this very special holiday event, contact Jan Fry at at (402) 553-4890, ext. 145. We hope you can join us for these exceptional events! Omaha Community Playhouse's 21 & Over program is pleased to present Neighborhood 3: Requisition of Doom. Something isn’t quite right in this quiet cul-de-sac of identical homes. Neighborhood 3: Requisition of Doom plunges you into a household setting where the arrival of an online horror video game begins to blur the line between what is real and what is just a game. Filled with mystery, tension, humor and the undead, be ready to get sucked into the chaos of a virtual reality where fear has a life of its own. A fun, spine-tingling, zombie-filled ride through the scariest place on earth…suburbia. 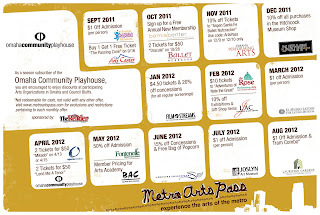 Enjoy the arts with a Metro Arts Pass! If you are a season subscriber to the Omaha Community Playhouse, in the month of October, you can sign up for a free new annual membership at the Bemis Center for Contemporary Art. You can also purchase two tickets for Dracula on Oct. 28 for $50 with Ballet Nebraska.